To carry a baby changes a pregnant woman’s center of gravity. It puts a lot of stress to the back and the neck, the muscles in the abdominal region and also the shoulders. The ligaments will be relaxed so the joint in the pelvic become less stable and posture also changes while pulling her pelvic forward. Adding the additional weight in the belly this is often causing aches in the lower back. Receiving massages during pregnancy can have many benefits, including reduced anxiety and depression, relief of muscular pain and improved circulation. Massage can also help pregnant women suffering from insomnia. Trained prenatal massage therapists know where to find a pregnant woman’s achy areas and may be able to provide pain relief and relaxation and more balance and also knows what techniques and areas to avoid. 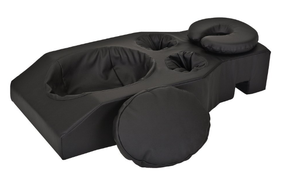 Our pregnancy cushion for massage tables enables our pregnant clients to lie in the prone position and receive a relaxing massage without having to sacrifice their personal comfort. In addition, the cushion is constructed from CFC-free urethane foam and Natursoft upholstery, ensuring it is built to last. In case you might also find it uncomfortable to climb up on or lay on a massage table even when cushioned, particularly late in pregnancy then a Chair Massage can be more comfortable for you and can be easier to get on and off than a table. Portrait of beautiful pregnant woman having a massage in spa. Pregnancy Massage is increasingly gaining popularity as pregnant women begin recognizing the benefits prenatal massage has to offer women during pregnancy. Back pain is one of the more common side effects of pregnancy. Back pain can continue throughout pregnancy and even after. If you have to carry around other small children you may find your symptoms exacerbated during pregnancy. Prenatal massage helps relieve oedema or swelling by stimulating circulation throughout the body. Massage is very beneficial for relaxing anxiety and reducing stress during pregnancy. Provides support for the new mother with physical and emotional demands of mothering. Pregnancy massage differs from a regular massage in a number of ways. There are certain parts of the body that contain acupressure points that may trigger uterine contractions, so the pressure and focus on these needs to be reduced. Also the positioning during a massage is critical to the safety and well-being of both the mother and the baby. Therefore you will be positioned on your side for the massage or in a semi-reclined position. Also never use the tables with the hole cut out for your belly as these cause undo stress to your lower back, it may seem like a great idea, but it isn’t. Toward the end of your pregnancy you might consider a prenatal massage to relax you during labour. Have a risk of or family history of pre-eclampsia.